I won’t miss you when you’re gone. I’ll be way too busy. Lots of lots of things to do. cosseted as a fetus escaped from abortion. But this separation has struck me dumb. Tonight, I’ll search for a new art hangout. to float above feelings as if walking on air. as long as I don’t come down. While you’re gone. Published in Concho River Review, Department of English and Modern Languages at Angelo State University, November, 2017 edition. I come from a long line of atheists. My grandparents were atheists; my parents were atheists. My siblings and I were always encouraged to think for ourselves but along with this freedom was the assumption that we would evaluate facts in a scientific manner to prove or disprove conjecture. Just before my grandmother, Helen, died I went to visit her. She gave me her car and a box of books and papers. I was really busy so I didn’t look at the materials in that box until later. Two weeks after my visit, the phone rang. The weird thing is, I picked up the phone before it started to ring. My father, who was on the other end, was startled. “Oh, you’re there,” he said with surprise. Then he told me that my grandmother had passed away. My children were small and I didn’t want them to hear me cry so I ran outside into our wooded yard and stood there in the dark looking up at the trees, sobbing hysterically. The moon came over the horizon and shone down on the backyard so it looked like snow, which I thought appropriate considering that my grandmother was from New Jersey. I stood out there in the beautiful moonlight and wept, recalling how much she meant to me. She was the one who encouraged me to read, widely and often. She was the one who believed I could do anything, even when I was a shy, skinny kid. She encouraged my wicked sense of humor and told me it was good to think for myself, not wait for some man to “rescue” me. When I went to visit her the last time, she told me about being in the hospital with terminal lung cancer and having a visit from a local minister. She told him she wasn’t religious and wasn’t interested in talking about God. He said, “Now, Helen, where do you think you’re going to go when you die?” Grandmother said, “Same place you are, fella, six feet under.” I laughed when she told the story. Okay, I know, I know. I’m not stupid. That was probably my subconscious comforting me. I understand that your brain can act as a shill for real experience. As researcher Warren S. Brown states in his article, Neuroscience and Religious Faith, it’s very possible that there is a specific molecule that allows for such a feeling of transcendence as I experienced that night. “A similar correlation has been found between measures of self-transcendence and a genetic marker for the dopamine transport molecule” (Brown, n.d., http://www.issr.org.uk/latest-news/neuroscience-and-religious-faith/). It could all be scientific. A few months later, I finally got around to going through all the papers she gave me. There were dozens of pages of a family tree that showed the relatives on her side of the family, the Roth family, going back to the Revolutionary War. In almost every generation, there was a Lutheran minister. Yes, my atheist grandmother came from a long line of Lutheran ministers. As a matter of fact, some of her relatives were responsible for the development of Theil College, in Greenville, Pennsylvania. The college has an affiliation with the Evangelical Lutheran Church in America. According to their website, “Institutional stability and development of Thiel College during its first decades in Greenville were achieved under the leadership of the brothers Henry and Theophilus Roth, Lutheran pastors who served respectively as Thiel president from 1870 to 1887 and 1893 to 1902, all but six of the first 32 years of the College!” (https://www.thiel.edu/about/history). I was stunned. After all those years of listening to my grandmother rant about how the churches should take their money and give it to the poor instead of hoarding it as gold crosses and expensive stained-glass windows, here I was looking at my family in a totally different light. Somehow, knowledge of this longstanding affiliation with the church gave me the courage to begin attending church myself. I began going to the Episcopal Church in my hometown of Gainesville, Florida. My son, Bryan, became an enthusiastic attendee and eventually he and I were both baptized into the Episcopal Church. My daughter chose not to go and that was fine with me. As my parents had done for us, I gave my children a choice about whether to attend church or not. In my own life, I began to see religion in a different way. I saw it as a comfort. Religion could explain things that were not explainable. I had a dear friend, Jodi, who was at work one morning when she literally fell out of her chair and slipped into a coma. To this day, no one knows what happened. It’s possible she was taking drugs or drinking too much. No one has ever been able to confirm that. When she fell to the floor at work, a coworker tried to revive her, and finally, after a considerable amount of time, called 9-1-1. At the time, Jodi and I both worked at the University of Florida. She was revived by campus police but was in what the doctors told me was a permanent vegetative state. According to the police she had been clinically dead for over 10 minutes by the time they arrived. I was told she would never survive. As she had no close relatives, it was my job to find someone related to her so we could issue a do not resuscitate (DNR) order. I spent weeks in Jodi’s ICU hospital room, so many hours that eventually the nurses stopped telling me when visiting hours were and just let me stay. A distant cousin came to visit and issued the DNR. She also gave me permission to be Jodi’s guardian, in case any further decisions needed to be made. For weeks, we waited for her to pass on. She always seemed to move randomly, strange movements that the nurses referred to as “posturing.” I know a little more about this now – according to an article in the journal Critical Care, “Different types of abnormal movements may be seen in the comatose state and may represent motor paroxysms in the setting of cerebral herniation, such as flexor or extensor posturing secondary to severe brain injury and subsequent cerebral edema” (Hannawi, Abers, Geocadin, & Mirski, 2016). These movements were frightening to watch, as if she were possessed. And though she was often alone, her room was never quiet. The machines performed all necessary functions. She was forced to breathe, fed by tubes, evacuated by tubes. The fact that she was still alive weeks after the initial incident was a scientific miracle. One day, I went downstairs to get a cup of coffee. There was a kiosk in the hospital lobby that offered strong coffee, and I stopped to get a cup. The woman behind the coffee cart asked me who I was there to visit and I told her I was visiting my friend Jodi, who was in a coma and dying. The woman, who had a decided Caribbean accent, asked me if it would be okay if she said a prayer for my friend. I thought that was sweet. She took my hand, and in a loud voice, so loud that others in the lobby turned to stare, she began to pray, “Father God, please help this woman’s friend. Father God, please bring this woman’s friend back to this world. Or if it is your decision, Father God, allow her to pass on and join you in your beautiful kingdom.” Not used to this type of public display, I was rather embarrassed. My prayers were silent. My prayers didn’t involve a lobby full of people staring. The prayer was very long, and when it was over, I thanked the coffee lady and went back to Jodi’s room. “There’s no way,” I answered. But the respiratory therapist chose to remove the tubes and surprisingly enough, Jodi did breathe on her own. Now I know there are these myths about people sitting up after months in a coma and saying, “Where am I?” Believe me, it’s not like that. It took months for Jodi to come back to the world. And because she had gone so long without oxygen, she had a severe anoxic brain injury. As her guardian, I was able to move her into an assisted living facility and she and I spent every holiday together. Do I think that prayer brought her back to the land of the living? Of course not. Those wonderful medical people who never gave up even when her prognosis was “not a chance in hell” were the ones who brought her back. But why did it happen the day after the coffee lady prayed for her? One of the nurses told me that one night when Jodi was still recovering from the coma, she heard her talking to her grandmother. I pointed out that both Jodi’s grandmothers had been dead for over thirty years. Oh, by the way, Jodi was an atheist – she didn’t believe in life after death. So okay, I want to find the scientific means to defer to the experts. I want them to locate proof that my grandmother told me it was going to be okay that night because she was the energy that existed in my back yard in the moonlight, and that the voice I heard was not my voice but her voice, her spiritual being, staying for a moment in her travels to comfort me. Why comfort me when she had so many children and grandchildren? I don’t know – maybe because I was the one who always argued with her, the one who wanted to find a way to unite religion and science. After all, why did she give me the family tree with all those Lutheran ministers in there? She knew I would keep them, preserve them, promote their legacy. Out of respect for her feelings, I attempted to understand and find a solution to the dichotomy between science and religion that would work for me. I wanted to put my beliefs into some form that would not be insulting to my grandmother’s memory, that would not be at odds with my mother’s philosophy. As I began to explore, I started reading about physics. Why physics? Because the phrase, “Nothing created, nothing destroyed,” resonated. Because, according to an article in the Atlantic, “And now, equipped with the predictive power of quantum physics, theoretical physicists are beginning to push even further, into new universes and new physics, into controversies once thought to be squarely within the domain of theology or philosophy” (Anderson, 2012, http://www.theatlantic.com/technology/archive/2012/04/has-physics-made-philosophy-and-religion-obsolete/256203/). Of course, physics is so much more complicated than I can comprehend. Still, I found it reassuring, something I could tell my mother I believe in and she wouldn’t lecture me about the uselessness of religion. The First Law of Thermodynamics became my touchstone. As the All About Science Website explains, “In its simplest form, the First Law of Thermodynamics states that neither matter nor energy can be created or destroyed. The amount of energy in the universe is constant – energy can be changed, moved, controlled, stored, or dissipated.” (http://www.allaboutscience.org/first-law-of-thermodynamics-faq.htm). And what was more energetic that the spirits of my mother and my grandmother? If nothing could be destroyed, no one could really die. A person’s spirit would become a different form of energy and continue in the universe. I know this is a very simplistic reading of the laws – I’m an English major, not a scientist. But this theory can be expanded. Or should I say, it did expand in my befuddled brain. My mother, Hazel, found out last year that she was suffering from congestive heart failure. She decided, at 84, that she had lived a good long life, and she wasn’t going to take any more treatment. When Mother went into Hospice, I visited her regularly and we had long conversations about religion and science. Mother was a social worker and a high school English teacher with a Master’s in Education. She, like her mother, Helen, was a brilliant person who read extensively and knew more about every subject than your average person. I tried to explain the miraculous science behind the First Law of Thermodynamics. She just laughed. She wasn’t willing to give me a pass just because I thought I’d found a way to make religious theory work with science. Albert Einstein became one of my heroes. I read about the theory of relativity and became convinced that somehow, this was the solution to my attempt at uniting science and religion. If the earth could deflect space and time just by its slow movement, why couldn’t we move on in a different way even when our physical selves ended? Would you like to hear my theory of attraction? Okay, scientists, take a deep breath – I know I don’t have this down perfectly. I don’t care. I imagined that on the space-time continuum, we could all reconnect at appropriate moments. Maybe we wouldn’t even know we were interconnected. Maybe there would just be a moment of comfort, a spell of silence from the aching thoughts that propelled us through our stressful world, a moment of moonlight in a darkened yard. As explained on Space.com, “He [Einstein] showed that the speed of light within a vacuum is the same no matter the speed at which an observer travels. As a result, he found that space and time were interwoven into a single continuum known as space-time. Events that occur at the same time for one observer could occur at different times for another.” If there is truly no “fixed frame of reference” (Redd, 2016, http://www.space.com/17661-theory-general-relativity.html), there is no beginning and no end. There is no end. Or, as Jodi would say, “Everything’s going to be all right, and we’re all going to the House of Pancakes” (Courtesy of the old TV show, Mary Hartman, Mary Hartman, http://www.imdb.com/title/tt0074021/ ). This is how we non-scientists comfort ourselves, by trying to make connections where perhaps none can be made. I’m not a physicist. I am, however, fascinated by the research. I was thrilled when the University of Florida, where I worked for so many years, announced that they had detected gravitational waves that reinforced Einstein’s theories (http://explore.research.ufl.edu/catch-a-wave.html). My ulterior motive is not that of a scientist – mine is only an attempt to make sense of something that makes no sense. Because of my family history, I can’t routinely accept that I will be “saved.” I can’t dismiss as lost the beautiful lives of my mother and my grandmother, who, by the way, were two of the most helpful, loyal, sweet, caring people in the world. The list of people they helped throughout their lives is too long for this essay. Yes, they were modern women. They were strong, sarcastic, funny. But each would literally give you the shirt off her back. How did they deserve to go to “hell,” only because they refused to accept any religion? My mother had very definite ideas about how her life would end. My youngest sister, Laurie, lived with her and took care of her, but Mother refused to allow any extraordinary measures to extend her life. She didn’t want to go to the hospital – she didn’t want any surgeries – she didn’t want tubes or breathing apparatuses, or machines. Like her mother before her, she made a decision that it was time to go and she was prepared. She made sure my father, who was in a veterans’ rehab facility for dementia, would be well-cared for. She made sure my sister, Laurie, would have financial security. To give Laurie a break from caring for my mother, I visited her frequently during the last year of her life, and every time I was impressed by how alert she was, despite having trouble breathing and being on morphine for pain. Mom and I had long discussions about everything, how her grandchildren and great grandchildren were doing, how my dad would do after she passed away, what would happen to Laurie when she no longer had Mother to care for. And we talked about religion. A lot. Her attitude was so similar to that of her own mother, Helen, that it was amazing. She wasn’t afraid to die. She wasn’t afraid of what would happen if she didn’t accept some form of religion, or some savior. She was ready to go and did not believe there was anything beyond this life. But there must be something more for them. The limited span of consciousness that is life is just not enough, because if it weren’t for them, so many people would not be alive today. My grandmother, Helen Roth Ihnen, had five children. My mother, Hazel Ihnen Thornton, had five children. And each of them was responsible for rescuing multiple people from tragic situations. They didn’t make a big deal about it. They just did it. After their deaths, people told me stories I didn’t know, about their kindness and their assistance. How could I see them in hell or as dust in the wind? “This isn’t a good time,” I answered. I’d already been to her house many times during the summer. I was very busy with work and various upcoming events. Apparently, I didn’t sense the urgency of the situation. “You need to come now!” she said. The tone of her voice told me this was not optional. This wasn’t a visit. I got on the road immediately. My sister, Laurie, had planned a vacation to visit my brother in North Carolina. We figured she would be gone for about ten days. I drove up and settled in, planning to cover for my sister for a week and a half. The first night, Laurie was still there. Mom seemed fine, if a bit weak. The hospice nurses came by and we talked about her medications, the liquid morphine, how to get in touch if I needed them. My sister packed and headed off for her vacation in the mountains. We spent the day, Sept. 10, 2016, talking about the presidential election, watching CNN and MSNBC, preparing for the ceremonies related to the Sept. 11 terrorist attacks coming up the next day. We talked about her children, her grandchildren, her great grandchildren. We talked about football. My parents were both football fanatics. I should point out here that I married a man who once played football for the University of Florida. My parents were so excited when I started dating Ken. They couldn’t believe that their sports-hating daughter was going to marry a football player. They also adored him for the wonderful man he is. Once when I split up with Ken while we were dating, my mother insisted I go back and apologize to him. Without her, I wouldn’t have my decades-long marriage. So many people were guided by her in similar ways. It’s easy to say that a bad person is going to hell. It’s easy to say that a non-believer is going to hell. What do you do about someone like my mother, whose list of charitable giving went beyond the norm but who refused to believe in the importance of any organized religion? What do you say about someone like my grandmother, who went out of her way for so many people, but thought religion was a con game perpetrated on the poor and the ignorant? The first night after Laurie left, Mom started to get up out of her chair to go to bed. She was using a walker. She tried to stand but was unable to rise. “I can’t get up,” she said. I have never been so close to the death of a human before. I’ve lost dogs and cats, but it’s different when it’s a sentient being who knows what’s happening. You don’t know what to say. Do you say goodbye? Do you say, I love you? I tried to tell her about my theory that when we die, we just become another form of energy. She waved her arms at me as if to say, “Just another one of those silly afterlife theories.” I didn’t pursue it. I brought food she wouldn’t eat. I put her ventilator mask on and tried to help her breathe, but she took it off. I gave her small doses of morphine throughout the night, though it didn’t seem to help. The next day, she seemed more alert. She still couldn’t get up, though, so I called my middle sister, Valerie, who lived an hour away in Birmingham and she drove up immediately. We debated whether we should call the hospice nurse despite Mother’s wishes. We were afraid she would end up in the hospital, furious at both of us for betraying her. Eventually, we called 9-1-1 and asked the operator to send someone to help us move her. We explained that we didn’t want her transported to the hospital. The town sent a crew of firemen, who very sweetly shifted her into a wheelchair and transported her down the hall to her bed. She was embarrassed about needing their help. Still, she made jokes about how nice it was to be rescued by such handsome young men. They made jokes about how fun it was to help such a sweet old lady. They were all trying to be upbeat. My sister and I had to keep going outside to cry. Mother had to be cleaned up once she got in bed. It was clear she was going downhill fast. Though she didn’t want us to, we called the hospice nurse, who came and showed us how to tend to her. The nurse asked me privately if I was prepared to be alone with my mother when she passed. “We can move her to the hospital,” she said. “But –” The hospice nurse stopped. “Forever” is a relative term in those circumstances. Valerie and I turned on the Alabama football game for her. We debated whether to call my younger sister or not. It occurred to us that Mother had deliberately sent her away because she didn’t want her to be there when she died. Or maybe she was afraid Laurie would insist she go to the hospital. I don’t know. But if we didn’t call, would Laurie hate us forever for not letting her know how fast Mom was going downhill? We called. Laurie immediately jumped in the car in North Carolina and drove all night to get back to us. That night seemed unending. I held Mother’s hand as she gasped for breath, her breathing becoming slower and slower. Valerie prayed over her. As we sat there all night, waiting for the end to come, we read poetry to her, talked to her, whatever we could think of. We were both relieved when Laurie finally got there. My sisters were out in the living room talking when I sat in the room with my mother for the last time. I held her hand and whispered, “You’re okay, you’re okay.” She was practically thrashing now, almost as if she were having convulsions, the kind Jodi had when her coma was at its deepest. Posturing. I kept saying, “You’re going to be okay, you’re all right.” I knew from my experience with Jodi that hearing is the last sense to go. Finally, I said, “You’re all right and we’re going to be all right.” To my astonishment, she stopped flailing, opened her eyes, stared at me, and smiled. Faintly, it’s true, but it was definitely a smile. And then, like a breeze, she was gone. I don’t mean she died then. It would be hours before the labored breathing stopped, hours before the liquid morphine began to bubble up out of her mouth, the fluids left her system, the convulsions stopped. What I mean is that I could feel her self, her personality, her spirit, whatever you want to call it, leave her body. The body was still there but the person who was that person was no longer there. When it was all over, we three stood over her bed, unsure what to do. Finally, we called the hospice nurse, who brought in all kinds of people to take care of everything, removing the body, filling out paperwork, etc. We were devastated. You would think after all those months of hospice care, we would have been more prepared for her death, but no. I drove back home the next day. There was no reason to stay. There would be no funeral – she didn’t want any kind of religious service. On my way home, I turned a corner in the foothills of the Appalachians and the sunlight, which was just coming up, hit the tops of the trees at an angle which made the woods look like they were catching fire. I thought of my mother missing this beauty. Hysterical, I pulled off the to the side of the road. Yes, you can say, see that light shining through those trees, illuminating those woods? That happens because the light enters your eye through the pupil, passes through the lens, focuses on the retina, blah blah, blah. And that would be true. But tell me why, scientifically, when I saw that light shining through those trees on my way home, did I find it so insufferably beautiful that it made me cry? head for notes, shy, waiting to be discovered. a Marquis marked, changed more than you supposed. embarrass you with their sentimentality. and the morning shafts of sunlight in a bar. Here is where you are now, Babe. You’ve arrived. Nothing can sustain such perfection. let me die. For God’s sake, don’t bring me back. If I drop dead at this table, move to another. who expect me to stay past well enough. existing for years on nothing but air. That’s all it says, all it has to say. Nothing to understand, no cosmic plan. you won’t go gently either. No sunlight invades the bottom of the bowl. towards fire-hardened roots, older than the millennium. the trees generate their own air. delighted children sprint the paths. and no one steals their souls. God created just for me. 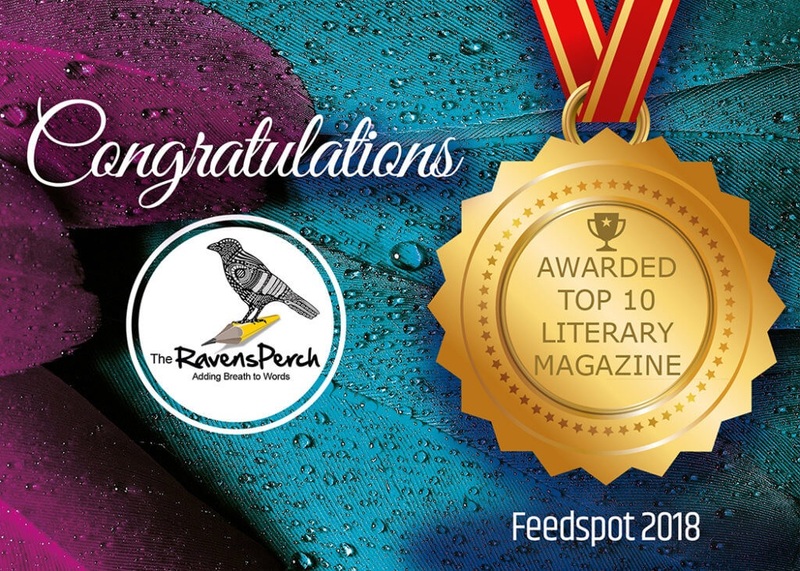 Riverteeth, Confluence and other literary magazines. What did grandfather find in the freemasons? the secrets of Rosslyn safe from some silly book. Would Solomon’s temple rise in his mind? of the Knights Templar, wishing to obscure his past? Did his wealthy Catholic family object, just as the old ones did? of this old knight challenging history? in an open roadster, repainting billboards. who had come to build their own new world. who came in the end, dropped petals on his grave. assisted by their connection to this new place. Hard to dismiss their willing grace. The fire/rescue unit calls me out of the surf. and rip tides that make you gasp. noise of surf and breeze blowing content from my brain. floating out to sea on a rip current, no resistance. but the fire/rescue guys don’t laugh. Margaret has a black thumb. She has never been able to make anything to grow. She transplants all manner of cuttings and they blossom for a day or two, then wither and die. When she plants seeds, nothing happens. They don’t even break the ground. Her house plants, torn asunder by cats desperate for the great outdoors, hang bedraggled and limp, branches broken, leaves frayed. Every year, she tries to plant the live Christmas tree she buys. Every year it dies. One spring, Margaret notices that her neighbor across the street has a whole garden full of red, beefy tomatoes. She is so envious. If the neighbor can grow those beautiful fruit/vegetables, why can’t she? She’s an intelligent person. She’s not totally incompetent. The soil is the same on this side of the street as it is on that. She ought to be able to grow freaking tomatoes. Burned in the past, Margaret knows better than to buy seeds. She buys tomato plants in special pots that guarantee they’ll grow. The tomato plants pop up six inches from their cardboard pots. The soil they are planted in is dark and marled with special ingredients. She plants them on the same side of her yard that her neighbor planted his. He is outside weeding. She waves and he waves back. “I’m growing tomatoes,” she shouts. “Braggart”, she thinks. 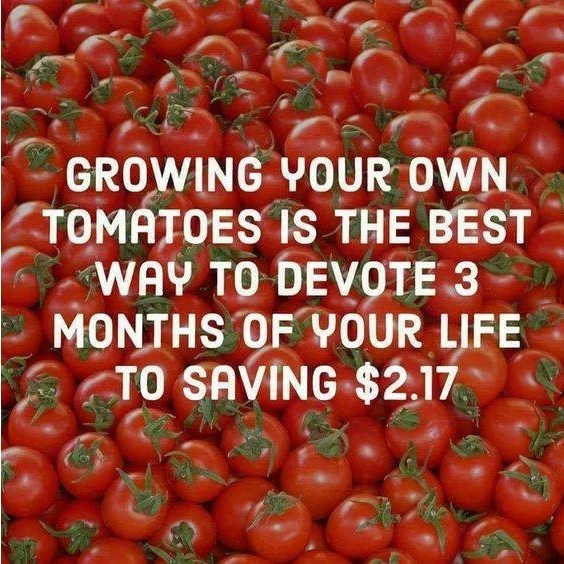 But she laughs and continues planting her tomatoes. Immediately, the minute the last trowel of earth is turned, the drought begins. It is the worst drought the southeast has ever experienced, weeks without rain. Drinking water dries up. No one is allowed to water their lawns. Washing your car is a criminal offense. Margaret stares, distraught, at the sticks where her tomato plants used to be. At first, she tries to keep up with the watering. She uses overflow from showers. She puts a bucket in the bathtub and makes everyone in her family produce water after each sojourn in the tub. But the plants are so dry from the record-setting heat, that she knows the effort is futile. Just when she thinks she’ll mow down the sticks and start over, it begins to rain. From drought to monsoon in one easy session. Every day, she comes home, opens her cumbersome umbrella, drags her briefcase inside and battens down the hatches for the evening. Water seeps into her shoes. Her roof is leaking. Her car is leaking. It is so wet outside, the cats don’t even bother to rush the door. She forgets she ever gardened. Finally, the rain stops. There is a Disney-esque sunrise. The world looks green and beautiful. She comes home from work in the afternoon and gets out of her car, grateful that she doesn’t have to wrestle the golf umbrella into submission. She is about to go inside when something catches her eye, a flash of red. And there it is, beautiful as a waxed fruit, a perfect two-inch tomato where a stick used to be. The plant has blossomed with leaves and the 2-inch tomato decorates the green foliage. She bends down and stares at the flawless fruit. It is the same size the next day, and the next. It doesn’t seem to grow. But it is spectacular. Reluctantly, afraid it will start decaying, she plucks the tomato and takes it inside. Her first home-grown anything. Margaret wonders if there’s some way to preserve the tomato. She has the first dollar bill she ever made. This could be a decorative item just like the dollar bill. But she can’t find anything on the Internet about permanently preserving fruits or vegetables. At dinner, she cuts the tomato into tiny, perfect wedges and decorates a salad with them. “Do you see that?” she asks her husband. “Oh, great, you grew a tomato,” he answers. The tomato is fantastic. She hates to eat it, but is thrilled by the juiciness of the taste, so much richer than the flat, boring tomatoes she buys in the grocery store. She wonders if she could grow enough food to feed her family. She has a large backyard. She could start a nice garden. She could bring in a few chickens and have eggs for protein. She could buy goats for milk. Imagine living off the land. When she first started college she had a boyfriend who tried to live off the land. He was very successful with his marijuana plants but, alas, not so much with the other flora. He frequently came to her house to eat when his crops failed. But maybe he didn’t have her abilities. Maybe he didn’t have her patience. “What would you think if I quit my job?” she asks her husband. He knows how exhausted she has been, how stressful her work. Nevertheless, “I’d think you lost your mind,” he says. Margaret decides to buy more plants. She will plant them and see what happens. If they grow, like the two-inch tomato, this will be a sign. She may have a black thumb, but she’s good at reading signs. We’d seen each other a few times at various parties around town and whenever he saw me, he was very attentive, polite, funny, courteous. He made other people move so I could sit next to him. I went to his house, which always seemed to be party central, and he played my favorite songs on his jukebox. Yes, he had a jukebox in his house. And fluorescent lights. You would think that the barroom décor would have set off alarm bells in my nineteen year old brain, but noooooo. But the first time we really got together was when he invited me to a party at Crescent beach in a huge house right on the ocean. I drove over by myself from Gainesville and when I got there, the place was so packed I couldn’t even find George. Everyone was dancing to the Rolling Stones song Hot Stuff, and I wandered around in the crowd, looking for him. Then I realized that the room was filling with smoke. I started to panic – “We’re on fire,” I told people. “We need to get out – the house is on fire.” Finally, one of the guests took my hand and dragged me over to a nearby hibachi, a little barbeque pit. It turned out someone (three guesses who) had thrown a pound of pot on the hibachi. You could literally not avoid getting high if you were breathing. In no time, it seemed my feet were barely touching the floor. I had to get away. I went outside and stood on the beach, watching the waves roll in, totally hypnotized. When I went back inside, I drank one beer after another as people handed them to me. Completely lost count. The next thing I knew, I was throwing up in the bathroom, totally humiliated. Imagine my surprise when George came along, threw everyone out of the bedroom, and helped me to bed. I was terrified about what would happen next. Then this craggy forty year old man who knew I was basically paralyzed covered me up with a sheet, lay down on the floor next to me, and slept there all night. Eventually, I dropped out of school and moved in with George. I was an old soul, one of those people who had never done youthful, crazy things. But with George, I could be totally spontaneous – skip work and go camping, leave class and head to the Ocala National Forest, skip my exam and head to the beach. My parents hated him, but I loved my new life. Except, it was a little difficult for someone who was an introvert. We were never alone. The party went on all the time. George worked three nights a week at a beer and wine drive through and it took me a while to realize that the way he really made his money was through selling pot. He was always surrounded by a crew of guys. I called them the lost boys. They literally waited on him hand and foot. One man who moved in with us was a huge, muscular ex-con named Victor. I thought it was so sweet of him to give Victor a place to stay and a job after he got out of prison. Of course, it turned out that the job wasn’t just working at the Beer and Wine mart – he was George’s bodyguard! George liked jokes. One day about ten of us were coming back from the beach in his station wagon. (Yes, back in the old days, when you didn’t’ have to have a seatbelt). Even though we thought he was crazy, he picked up a hitch-hiker. The hitchhiker was young and handsome and began to flirt with me. George asked him what he did, and the kid said he was a student and a surfer. “And what do you do?” he asked George. “Huh?” the student surfer said. This fuzzy-haired, bearded, balding old man was a shrink? “Huh?” the student surfer said. “I don’t understand,” the student said. When my daughter was born, I thought George would change. He said he would. He said he’d get a real job, that he’d quit drinking, that he would change his ways. Duh. I believed him. Youth is wasted on the young. The day we came home from the hospital, George threw a huge party for all his friends. There I was, trying to learn to nurse a new baby, and the house was filled with wild, crazy people, some I didn’t know, who were all there to see George’s new child. George went out to get firewood, leaving me alone with this drunken, celebrating crowd. And he didn’t come back all night. On her first birthday, George went out to get firewood, and he didn’t come back all night. Now, I’m not always the sharpest knife in the drawer when it comes to relationships, but I realized that if I didn’t change my life, this was the way my daughter was going to grow up. It’s one thing to make that decision for yourself. It’s another to dump your child into such a situation. So I packed up my stuff and drove away the next day. I was never going to get married again. I ended up living with my parents for a while, in Birmingham, Alabama. I dated a few people. One guy said to me, “You know, you could give the kid to your parents.” “When?” I asked. He kind of waved his hands and said, “You know, like – “ Duh. Like permanently? Did not see that one again. I was very depressed. I had a great job in Birmingham, I was going to college, my parents were very sweet and welcoming. But I felt so out of place there. One day I went to a shrink – a real one. He said, go home and do something you really want to do. I went home and thought and thought. I couldn’t think of anything I wanted to do. Except move back to Gainesville. So, I packed up and moved back. My mother kept following me around the house as I was packing, saying, “That’s not what he meant, that’s not what he meant.” Whatever. The only thing I could think of that I wanted to do was go home. I was a single parent, I was not the least bit interested in getting married again. I was doing my best Greta Garbo – I want to be alone. But I had to get out once in a while. After all, I was 25 years old, alone with a 3 year old, and I had no life. So one night, in a bar called Eddy C’s, I met a handsome, bearded young man, and had a one night stand. I never expected to see him again. The next day, he showed up at my work and asked me out. I was stunned. But I went out with him. And I even introduced him to my little girl. They hit it off right away. It turned out that he and I had gone to high school together. Of course, I didn’t know him back then – he was captain of the football team, prom king, a basketball player. I was on the literary magazine and the newspaper – and two years younger. But we had passed within a few feet of each other for over 10 years. In fact, one of my best friends found a note with his phone number on it in her bedroom! We kept dating and he asked me to move in with him. Even though by this time I adored him, I was really nervous. But eventually I decided to give it a try. We lived together for two years. During that time, he asked me to marry him a couple of times. Each time, I said no. “Why don’t we just keep things the way they are?” But eventually I gave in and we decided to marry. And then I got pregnant again. My new husband, Ken decided he wanted to adopt my daughter so that she would know that she was his child just as much as the new baby. We asked George to give up custody, and he said no. We were in a panic. We’d spent so much money on the lawyer, we were in school, both working two or three jobs, and had a new baby and a five year old. The lawyer was very smart. She sent George a letter that read, “We understand how difficult it must be to imagine giving up custody of your child. Therefore, please send five years of child support as soon as possible.” He signed the adoption papers.